A boisterous wolf pup and an awkward young porcupine are unlikely allies in this tale of friendship set on Alaska’s tundra. The two grow up as neighbors, but only through helping each other escape from a trapper do they learn what it means truly to be friends. Gently inspired by the fable of “The Lion and the Mouse,” Pup and Pokey teaches young readers about living in the wilderness and the sometimes unexpected connections that arise in our lives. Pup and Pokey is the first children’s book from acclaimed Alaska author Seth Kantner. 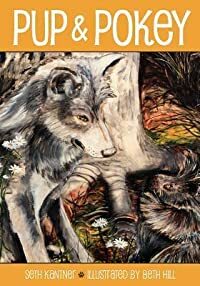 With Kantner’s storytelling and Beth Hill’s original illustrations, Pup and Pokey is a touching outdoor adventure story that only two talented Alaskans could tell.